One of our favorite culinary minds is the inimitable Alton Brown. If we’ve learned one lesson from his show, it is to eschew kitchen “uni-taskers,” those appliances you can use for one purpose and one alone. You won’t find apple slicers or avocado pitting/slicing/scooping gadgets in our kitchens. So when we saw a feature in Everyday Food Magazine about using muffin tins for purposes other than creating muffins or cupcakes, we figured we’d do AB proud and whip up a recipe. Stacey made the egg cups with bacon the first time, and sans bacon at a brunch with vegetarian guests. She modified the original recipe. Here’s how she made them. 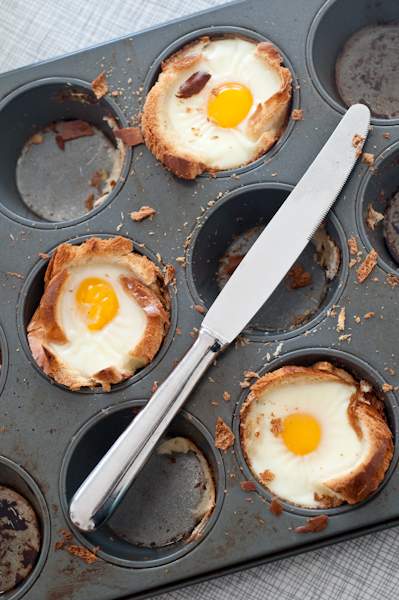 Spray as many muffin tins as egg cups you wish to make. We usually make enough for one or one-and-a-half per person. If you wish to use sandwich bread, roll each slice flat with a rolling pin and then slice off the crusts. (The crusts are great to snack on as you cook!) Slather a little bit of butter on the center of the bread before placing it into each cup. The egg cups pictured are made with challah, which you also roll with the pin, but only slice off the bottom crust. A little cutting and shaping was involved with getting the challah to fit well in the cups, but it wasn’t difficult. To accent the dish with heavenly slabs of meat, cook strips of bacon for a few minutes on each side. Place a strip in each cup and then crack an egg into the cups. Top with a sprinkling of salt and/or pepper. Bake to desired egg consistency; about 20 minutes for a slightly runny egg, 23 or more minutes for an egg that’s fully cooked. Get creative with add-ins, such as herbs, other kinds of meat, and veggies. Do you have a creative use for a muffin tin? Are we too quick to judge uni-taskers? Is there a uni-tasker in your kitchen that you can’t live without? love this idea! I did something similar but used sliced turkey or ham as a liner and then filled with egg/cheee/vegetable mixture and baked. you can also use muffin tins for mini meatloafs. or to make GIANT ice cubes with flowers inside: really pretty. Ooh ice cubes with flowers?! I love this idea for brunch. Yum yum. I know what you mean about unitaskers, but I can’t really imagine another way to make muffins. I definitely make muffins once a month (bananas that get outta control, you know the drill). I do use my “avocado smasher” to smush other things though. Yum. I’m not one for gadgets, so I use the few I do have for everything. But for me, the mac-daddy of them all is a good chef’s knife and a huge, solid cutting board that’s perfect for everything from rolling pastry to getting a hot pizza out of the oven.